Parcels have been sent to various places under different places with mail services as far back as the fifteenth century in some European countries. However, it was the arrival of railways that brought the modern parcel post systems into play with the idea of uniform standardised rates. Germany is credited as the first country to develop the modern parcel post in. In 1857 tariffs were introduced for Germany and Austria that took into account the weight of the parcel and then varying rates for the distance. There was a further fee if the object was either bulky, fragile or would take up an unusual space (for example, baskets with plants, cages with live animals, hat boxes or furniture). Meanwhile, Great Britain developed its own system that used a single flat fee for parcels of a given weight, regardless of the distance to travel. Both methods were used by other countries to model their own parcel mail methods. The relative success of either method varied as it depended on the geography of the country involved. European countries tended (and still are) relatively densely populated, making average distance for parcels to travel relatively small. By comparison, countries such as Canada, Australia and the United States have relatively densely populated pockets but also large distances between cities that increases costs involved. 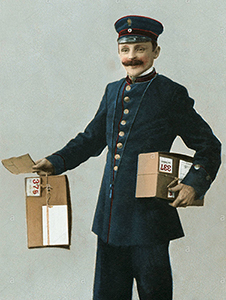 In 1881 the Universal Postal Union (an international organisation to regulate postal treaties) first established the international parcel service to allow the orderly shipment of mailed packages and parcels from one country to another according to predetermined rates. Prior to this, each country had to prepare separate postal treaties with other nations to carry international mail to or from them. In some cases this meant that senders would need to calculate postage for each leg of a journey and add postage for each leg or find mail forwarders to a third country if there was no direct route. 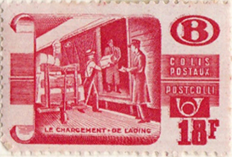 As parcel post became popular, a few countries created parcel stamps to label packages. Belgium and Italy both have a long history (1879 and 1884 respectively) for parcel stamp issues. The United States issued parcel post stamps in 1912-13 but they were discontinued due to confusion due to confusion with about their use. Most countries however, seem to use their regular postage stamps and no International Roundworld parcel stamp equivalent exists, at least as far as this author can tell. 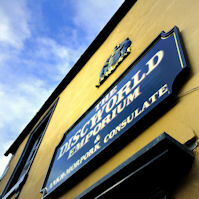 There are already websites that cover Discworld Stamps, such as Discworld Stamp Catalogue, the Discworld Stamp Collector. The Journal Stamp News pages cover future stamps. The Stanley Howler Journal is brought to you by the Discworld Emporium where you can find all your Discworld and Flatalist needs.